Acute endocarditis is life-threatening and often requires surgical intervention.Subacute endocarditis is an indolent disease that can continue for months. Infective endocarditis remains a serious but relatively uncommon problem. The incidence varies from series to series, being estimated to be as high as 11 per 100,000 population, and as low as 0.6 per 100,000 population. The exact incidence is difficult to ascertain, because the definitions for endocarditis differ in many surveys. A reasonable estimate is probably 2 per 100,000 population. This means that a primary care physician will encounter only 1 to 2 cases over a working lifetime. Endocarditis is more common in men than in women, and the disease is increasingly becoming a disease of elderly individuals. In recent series, more than half of the patients with endocarditis were over the age of 50 years. With available rapid treatment for group A streptococcal infections, the incidence of rheumatic heart disease has declined, eliminating this important risk factor for endocarditis in the young. With life expectancy increasing worldwide, the percentage of elderly people will continue to rise, and the number of elderly patients with infective endocarditis can be expected to increase in the future. A rare disease; a primary care physician is likely to see just 1 to 2 cases in an entire career. Increasingly a disease of elderly individuals. Infective endocarditis is usually preceded by formation of a predisposing cardiac lesion. Pre-existing endocardial damage leads to the accumulation of platelets and fibrin, producing nonbacterial thrombotic endocarditis. This sterile lesion serves as an ideal site to trap bacteria as they pass through the bloodstream. Cardiac lesions that result in endocardial damage and predispose to the formation of nonbacterial thrombotic endocarditis include rheumatic heart disease, congenital heart disease (bicuspid aortic valve, ventricular septal defect, coarctation of the aorta, and Fallot's tetralogy), mitral valve prolapse, degenerative heart disease (calcific aortic valve disease), and prosthetic valve placement. Risk factors for endocarditis reflect the pathogenesis of the disease. Patients with congenital heart disease and rheumatic heart disease, those with an audible murmur associated with mitral valve prolapse, and elderly patients with calcific aortic stenosis are all at increased risk. The higher the pressure gradient in aortic stenosis, the greater the risk of developing endocarditis. Intravenous drug abusers are at high risk of developing endocarditis as a consequence of injecting bacterially contaminated solutions intravenously. Platelets and bacteria tend to accumulate in specific areas of the heart based on the Venturi effect. When a fluid or gas passes at high pressure through a narrow orifice, an area of low pressure is created directly downstream of the orifice. The Venturi effect is most easily appreciated by examining a rapidly flowing, rock-filled river. When the flow of water is confined to a narrower channel by large rocks, the velocity of water flow increases. As a consequence of the Venturi effect, twigs and other debris can be seen to accumulate on the downstream side of the obstructing rocks, in the area of lowest pressure. Similarly, vegetations form on the downstream or low-pressure side of a valvular lesion. In aortic stenosis, vegetations tend to form in the aortic coronary cusps on the downstream side of the obstructing lesion. In mitral regurgitation, vegetations are most commonly seen in the atrium, the low-pressure side of regurgitant flow. Upon attaching to the endocardium, pathogenic bacteria induce platelet aggregation, and the resulting dense platelet-fibrin complex provides a protective environment. Phagocytes are incapable of entering this site, eliminating an important host defense. Colony counts in vegetations usually reach 10 to 10 bacteria per gram of tissue, and these bacteria within vegetations periodically lapse into a meta-bolically inactive, dormant phase. The frequency with which the four valves become infected reflects the likelihood of endocardial damage. Shear stress would be expected to be highest in the valves exposed to high pressure, and most cases of bacterial endocarditis involve the valves of the left side of the heart. The mitral and aortic valves are subjected to the highest pressures and are the most commonly infected. Right-sided endocarditis is uncommon (except in the case of intravenous drug abusers), and when right-sided disease does occur, it most commonly involves the tricuspid valve. The closed pulmonic valve is subject to the lowest pressure, and infection of this valve is rare. Patients with prosthetic valves must be particularly alert to the symptoms and signs of endocarditis, because the artificial material serves as an excellent site for bacterial adherence. Patients who have recovered from an episode of infective endocarditis are at increased risk of developing a second episode. Nonbacterial thrombotic endocarditis results from valve damage that is followed by platelet and fibrin deposition. Venturi effect results in vegetation formation on the low-pressure side of high-flow valvular lesions. Disease of the mitral or aortic valve is most common; disease of tricuspid valve is rarer (usually seen in intravenous drug abusers). The organisms responsible for infective endocarditis are sticky. They adhere more readily to inert surfaces and to the endocardium. Streptococci that express dextran on the cell wall surface adhere more tightly to dental enamel and to other inert surfaces. Streptococci that produce higher levels of dextran demonstrate an increased ability to cause dental caries and to cause bacterial endocarditis. Streptococcus viridans, named for their ability to cause green ("alpha") hemolysis on blood agar plates, often have a high dextran content and are a leading cause of dental caries and bacterial endocarditis. S. mutans, and S. sanguis are the species in this group that most commonly cause endocarditis. One group D streptococcus, S. bovis, produces high levels of dextran and demonstrates an increased propensity to cause endocarditis. This bacterium often enters the bloodstream via the gastrointestinal tract as a consequence of a colonic carcinoma. S. viridans also express the surface adhesin FimA, and this protein is expressed in strains that cause endocarditis. Candida albicans readily adheres to nonbacterial thrombotic endocarditis in vitro and causes endocarditis, particularly in intravenous drug abusers and in patients with prosthetic valves. С krusei is non-adherent and seldom causes infective endocarditis. Adherence to specific constituents in the nonbacterial thrombotic endocarditis also may be important virulence characteristics. For example, pathogenic strains of S. sanguis are able to bind to platelet receptors, and endocarditis-causing strains of Staphylococcus aureus demonstrate increased binding to fibrinogen and fibronectin. Bacteria with high dextran content stickto non-bacterial thrombotic endocarditis more readily; they also cause dental caries. Streptococcus viridans is the leading cause of subacute bacterial endocarditis. S. bovis also has high dextran content; associated with colonic carcinoma. Candida albicans adheres well to nonbacterial thrombotic endocarditis; С krusei adheres poorly. Before bacteria can adhere to nonbacterial thrombotic endocarditis, they must gain entry to the bloodstream. Whenever a mucosal surface heavily colonized with bacterial flora is traumatized, a small number of bacteria enter the bloodstream, where they are quickly cleared by the spleen and liver. Dental manipulations frequently precipitate transient bacteremia. 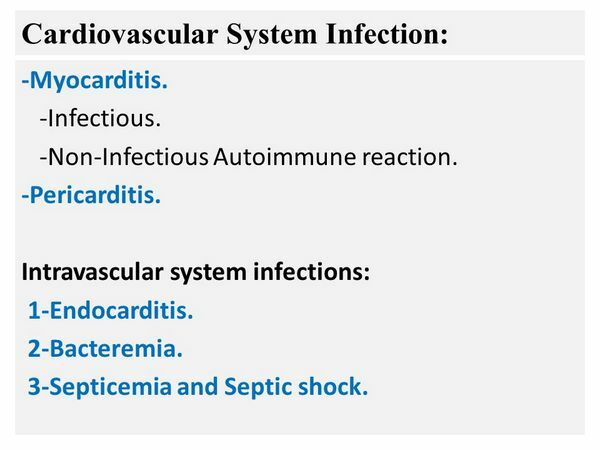 Causes of bacteremia that can lead to infective endocarditis. Patients undergoing dental extraction or periodontal surgery are at particularly high risk, but gum chewing and tooth brushing can also lead to bacteremia. Oral irrigation devices such as the Waterpik should be avoided in patients with known valvular heart disease or prosthetic valves, because these devices precipitate bacteremia more frequently than simple tooth brushing does. Other manipulations that can cause significant transient bacteremia include tonsillectomy urethral dilatation, transurethral prostatic resection, and cystoscopy. Pulmonary and gastrointestinal procedures cause bacteremia in a low percentage of patients. The organisms most frequently associated with infective endocarditis are able to colonize the mucosa, enter the bloodstream, and adhere to nonbacterial thrombotic endocarditis or native endocardium. In native valve endocarditis, Streptococcus species are the most common cause, representing more than half of all cases. S. viridans species are most frequent, followed by S. bovis. Staphylococcus species are the second most common cause, and in some recent series, they have exceeded the streptococci in frequency. Staphylococcus aureus predominates, with coagulase-negative staphylococci playing a minor role. Enterococci (S. faecalis and S. faecium) are now classified separately from the streptococci, and in most series, these organisms are the third most common cause of infective endocarditis. Other rarer organisms include gram-negative aerobic bacteria, and the HACEK (Haemophilus aphrophilus, Actinobacillus -actinomycetemcomitans,Cardiobacterium hominis, Eike nella corrodens, and Kingella kingae) group. These slow-growing organisms are found in the mouth and require CO2 for optimal growth. They may not be detected on routine blood cultures that are discarded after 7 days. Anaerobes, Coxiella burnetii ("Q fever endocarditis"), and Chlamydia species are exceedingly rare causes. In about 3% to 5% of cases, cultures are repeatedly negative. In intravenous drug abusers, the microbiology differs, with S. aureus and gram-negative organisms predominating. In certain areas of the country — for example, Detroit, Michigan — methicillin- resistant S. aureus (methicillin-resistant Staphylococcus aureus) is the predominant pathogen. Pseudomonas aeruginosa, found in tap water, is the most common gram-negative organism. Streptococci also are common, particularly Enterococcus and S. viridans species. Fungi, primarily C. albicans, is another important cause of endocarditis in this population. Polymicrobial disease is also more frequent. The causes of prosthetic valve endocarditis depend on the timing of the infection. The development of endocarditis within the first 2 months after surgery ("early prosthetic valve endocarditis") is primarily caused by nosocomial pathogens. Staphylococcal species (coagulase-positive and -negative strains alike), gram-negative aerobic bacilli, and fungi predominate. In disease that develops more than 2 months after surgery ("late prosthetic valve endocarditis"), organisms originating from the mouth and skin flora predominate: S. viridans species, S. aureus, and coagulase-negative staphylococci being most common. Gram-negative aerobic bacilli and fungi are less common, but still important pathogens. HACEK group is an uncommon cause, but consider in culture-negative cases (hold blood cultures for more than 7 days). Most common cause is S. aureus. A 78-year-old retired advertising executive was admitted to the hospital with a chief complaint of increasing shortness of breath and ankle swelling. About 15 weeks before admission, he had had some dental work done. About 2 weeks after that work was completed, he began to experience shortness of breath following any physical exertion. He also noted increasing fatigue, night sweats, and intermittent low-grade fever. At that time, a diastolic murmur, UNI was noted along the left sternal border, maximal at the third intercostal space. He was treated as an outpatient with diuretics for left-sided congestive heart failure. The day before admission, he began experiencing increasingly severe shortness of breath. He also began coughing frothy pink phlegm, and he arrived in the emergency room gasping for air. Physical examination showed a temperature of 39°C, blood pressure of 106/66 mm Hg, a pulse of 85 per minute regular, and a respiratory rate of 36 per minute. The patient appeared lethargic and had rapid shallow respirations. His teeth were in good repair. No hemorrhages or exudates were seen in the fundi. With the patients sitting at a 30-degree angle, the jugular veins were distended to the level of his jaw; diffuse wheezes and rales were heard in lower two thirds of both lung fields. The heart demonstrated a loud S3 gallop, ll/VI nearly holosystolic murmur heard loudest in the left third intercostal space radiating to the apex, and a ll/VI diastolic murmur heard best along left sternal border. Liver and spleen were not palpable. Pitting edema of the ankles(2+) extending midway up the thighs was noted. Nail beds had no splinter hemorrhages. Pulses were 2+ bilaterally. The laboratory workup found a white blood cell (white blood cell) count of 11,700/mm3, with 69% polymor-phonuclear leukocytes, 4% band forms, 22% lymphocytes, and 3% mononuclear cells, and a hematocrit of 30%, normochromic, normocytic. Uri-nalysis showed 1 + protein with 10 to 20 red blood cells and 5 to 10 white blood cells per high-power field. The patient's erythrocyte sedimentation rate was 67 mm/h. An electrocardiogram showed normal sinus rhythm, with left bundle branch block. A chest radiograph revealed extensive diffuse perihilar infiltration bilaterally. Four of four blood cultures were positive for S. viridans. When the event leading to bacteremia can be identified, the incubation period usually required before symptoms develop is less than 2 weeks. In case 7.1, the onset of symptoms occurred 15 days after dental work. Because symptoms of endocarditis are usually nonspecific, a delay of 5 weeks occurs, on average, between the onset of symptoms and diagnosis. In case 7.1, the delay was 3 months. As observed in this patient, the most common symptom is a low-grade fever. Body temperature is usually only mildly elevated in the 38°C range, and with the exception of acute endocarditis, it seldom rises above 40°C. Fever is frequently accompanied by chills and less commonly by night sweats. Fatigue, anorexia, weakness, and malaise are common complaints, and the patient often experiences weight loss. Myalgias and arthralgias are also common complaints. Patients are often mistakenly suspected of having a malignancy, connective tissue disease, or other chronic infection such as tuberculosis. Another prominent complaint in a smaller percentage of patients is low back pain. Debilitating back pain that limits movement can be the presenting complaint, and health care personnel should always consider infective endocarditis as one possible cause of low back pain and fever. Systemic emboli can result in sudden hemi-paresis or sudden limb pain as a consequence of tissue ischemia. In all patients who suffer a sudden accident consistent with an embolic stoke, infective endocarditis should be excluded. In addition to a subacute onset, some patients can present with rapid onset (hours to days) of symptoms and signs. Acute infective endocarditis is most commonly associated with S. aureus or enterococci, and occasionally with S. pneumoniae. Fever is often high, 40°C, accompanied by rigors. These patients are usually brought to the emergency room acutely ill. The likelihood of serious cardiac and extravascular complications is higher in these patients, particularly those with acute S. aureus endocarditis. Rapid diagnosis and treatment are mandatory to reduce valvular destruction and embolic complications. Nonspecific symptoms usually begin 2 weeks after initial bacteremia. On average, diagnosis takes 5 weeks from onset of symptoms. Low-grade fever is most common, may be accompanied by night sweats. Fatigue, malaise, generalized weakness, anorexia, and weight loss are common; mimics cancer. Myalgias and arthralgias may suggest a connective tissue disease. Low back pain can be the initial primary complaint. Consider endocarditis, epidural abscess, and osteomyelitis when back pain is accompanied by fever. Infective endocarditis must be excluded in all cases of embolic cerebrovascular accident, particularly in younger patients. In acute endocarditis,fever is high (40°C range), and the patient appears acutely ill. The classical physical findings of infective endocarditis should be carefully searched for. Fever is the rule and is detected in 95% of patients. A heart murmur is almost always seen. A cardiac murmur is heard in nearly all patients. Absence of a murmur should call into question the diagnosis of infective endocarditis. Classic changing murmur is rare, but it may occur with rupture of chordae tendinae. New aortic regurgitation is the result of infective endocarditis until proven otherwise. Embolic phenomenon are found in up to 50% of cases. are most common in the conjunctiva; clusters can be found anywhere. Splinter hemorrhages, linear streaks, are found under nails. Osier nodes, painful raised lesion in the pads of the fingers or toes,are evanescent. Janeway lesions, red macules,are more persistent and most common in acute endocarditis attributable to Staphylococcus aureus. Roth spots are retinal hemorrhages with a clear center. Splenomegaly can be found; left upper quadrant tenderness can occur with embolic infarction. Checkall pulses as a baseline because of the risk of obstructive emboli. Perform a thorough neurologic exam; a sudden embolic stroke can develop. The absence of an audible murmur should call into question the diagnosis of endocarditis, except in cases of right-sided endocarditis or infection of a mural thrombus (rare). Although classically described as a changing murmur, the character of the murmur usually does not change significantly over time unless a valve leaflet is destroyed (occurs most commonly with S. aureus) or a chordae tendinae ruptures. Detection of a new aortic regurgitant murmur is a bad prognostic sign and is commonly associated with the development of congestive heart failure. The most common cause of acute aortic regurgitation is infective endocarditis; therefore, if a high-pitched diastolic murmur radiating along the left sternal border is heard, the initial workup should always include blood cultures. The diagnosis was delayed because this man's outpatient physician did not exclude infective endocarditis as the cause of the new diastolic murmur. Careful attention must be paid to the fundi, skin, nail beds, and peripheral pulses, because manifestations attributable to emboli are noted in more than half of infective endocarditis cases. Fundoscopic exam may reveal classic Roth spots, retinal hemorrhages with pale centers, or, more commonly, flame-shaped hemorrhages. One of the most common locations to detect petechial-hemorrhages is the conjunctiva. This finding is not specific for endocarditis, however; it is also seen in patients after cardiac surgery and in patients with thrombocytopenia. Clusters of petechiae can be seen on any part of the body. Other common locations are the buccal mucosa, palate, and extremities. Presence of petechiae alone should be considered a nonspecific finding. The splinter hemorrhages (linear red or brownish streaks) that develop under the nail beds of the hands and feet are caused by emboli lodging in distal capillaries. These lesions can also be caused by trauma to the fingers or toes. Osier nodes are small pea-sized subcutaneous, painful erythematous nodules that arise in the pads of the fingers and toes and in the thenar eminence. They are usually present only for a brief period, disappearing within hours to days. Janeway lesions are most commonly seen in association with S. aureus infection. These hemorrhagic plaques usually develop on the palms and soles. Bacteria can sometimes be visualized on a skin biopsy of the lesion. It must be kept in mind that about half of all patients with infective endocarditis will demonstrate no physical evidence of peripheral emboli. The absence of embolic phenomena therefore does not exclude the diagnosis. Other findings can include clubbing of the fingers and toes. As a consequence of earlier diagnosis and treatment, this manifestation is less common than in the past, but it may be found in patients with prolonged symptoms. Another commonly reported finding is splenomegaly. Some patients experience left upper quadrant pain and tenderness as result of splenic infarction caused by septic emboli. Joint effusions are uncommon; however, diffuse arthralgias and joint stiffness are frequently encountered. Finally, all pulses should be checked periodically. A sudden loss of a peripheral pulse, accompanied by limb pain, warrants immediate arteriography to identify and extract occluding emboli. A thorough neurologic exam must also be performed. Confusion, severe headache, or focal neurologic deficits should be further investigated by computed tomography or magnetic resonance imaging scan with contrast of the head looking for embolic infarction, intracerebral hemorrhage, or brain abscess. Laboratory abnormalities are nonspecific in nature. Anemia of chronic disease is noted in 70% to 90% of subacute cases. A normocytic, nor-mochromic red cell morphology low serum iron, and low iron binding capacity characterize this form of anemia. Peripheral leukocyte count is usually normal. The finding of an elevated peripheral white blood cell count should raise the possibility of a myocardial abscess or another extravascular focus of infection. Leukocytosis is also often found in patients with acute bacterial endocarditis. The erythrocyte sedimentation rate, a measure of chronic inflammation, is almost always elevated. With the exception of patients with hemoglobinopathies that falsely lower the rate of red blood cell sedimentation, the finding of a normal sedimentation rate virtually excludes the diagnosis of infective endocarditis. In nearly all cases, C-reactive protein, another inflammatory marker, is also elevated. A positive rheumatoid factor is detected in half of these patients, and elevated serum globulins are found in 20% to 30% of cases. Cryoglobulins, depressed complement levels, positive tests for immune complexes, and a false positive serology for syphilis are other nonspecific findings that may accompany infective endocarditis. Urinalysis is frequently abnormal, with proteinuria being found in 50% to 65% of cases, and hematuria in 30% to 50%. These abnormalities are the consequence of embolic injury or deposition of immune complexes causing glomerulonephritis. A chest X-ray should be performed in all patients with suspected endocarditis. In patients with right-sided disease, distinct round cannonball-like infiltrates may be detected; these represent pulmonary emboli. In cases of acute mitral regurgitation or decompensated left-sided failure because of aortic regurgitation, diffuse alveolar fluid may be detected, indicating pulmonary edema. Finally the patient's electrocardiogram should be closely monitored. The finding of a conduction defect raises concern that infection has spread to the conduction system; in some cases, this spread may progress to complete heart block. The PR interval was prolonged, and this patient subsequently developed complete heart block. Findings consistent with myocardial infarct may be detected when emboli are released from vegetations in the coronary cusps into the coronary arteries. Anemia of chronic disease is found in most patients. The peripheral white blood cell count is normal, unless myocardial abscess or acute disease is present. Monitor the electrocardiogram closely; conduction defects can progress to complete heart block. Blood cultures are the critical test for making a diagnosis of infective endocarditis. As compared with most tissue infections — such as pneumonia and pyelonephritis — that result in the intermittent release of large numbers of bacteria into the blood, infective endocarditis is associated with a constant low-level bacteremia. The vegetation is like a time-release capsule, with bacteria being constantly released in small numbers into the bloodstream. It is this constant antigenic stimulus that accounts for the rheumatic complaints and multiple abnormal serum markers associated with infective endocarditis. To document the presence of a constant bacteremia, blood samples for culture should be drawn at least 15 minutes apart. In patients with suspected subacute infective endocarditis, three blood cultures are recommended over the first 24 hours. In these patients, antibiotics should be withheld until the blood cultures are confirmed to be positive because administration of even a single dose of antibiotics can lower the number of bacteria in the bloodstream to undetectable levels and prevent identification of the pathogen. However, if the patient is acutely ill, three samples for culture should be drawn over 45 minutes, with empiric therapy begun immediately thereafter. Because the number of bacteria in the blood is usually low (approximately 100/mL), a minimum of 10 mL of blood should be inoculated into each blood culture flask. Lower volumes reduce the yield and may account for many culture-negative cases. Routinely, blood cultures are held in the microbiology laboratory for 7 days and are discarded if negative. However, if a member of the slow-growing HACEK group is suspected, the laboratory must be alerted to hold the blood cultures for 4 weeks and to subculture the samples on chocolate agar in 5% C02. If nutritionally deficient streptococci are suspected, specific nutrients need to be added to the blood culture medium. The sensitivity of blood cultures is excellent, yields being estimated to be 85% to 95% on the first blood culture and improving to 95% to 100% with a second blood culture. The third blood culture is drawn primarily to document the constancy of the bacteremia; it does not significantly improve overall sensitivity. The administration of antibiotics within 2 weeks of blood cultures lowers the sensitivity, and patients who have received antibiotics often require multiple blood cultures spaced over days to weeks to identify the cause of the disease. Echocardiography is the other essential test that all patients with suspected infective endocarditis must receive. Transthoracic echocardiography is relatively insensitive (44% to 63%) for detecting vegetations as compared with transesophageal echocardiography (TEE: 94% to 100% sensitivity), which can detect vegetations smaller than 3 mm. As compared with Transthoracic echocardiography, TEE more readily detects extravalvular extension of infection (87% vs. 28% sensitivity); and more accurately visualizes valve perforations (95% vs. 45% sensitivity). A TEE is also preferred for investigating prosthetic valve endocarditis. When accompanied by Doppler-color flow analysis, echocardiography can assess valve function, myocardial contractility, and chamber volume — vital information for deciding on surgical intervention. 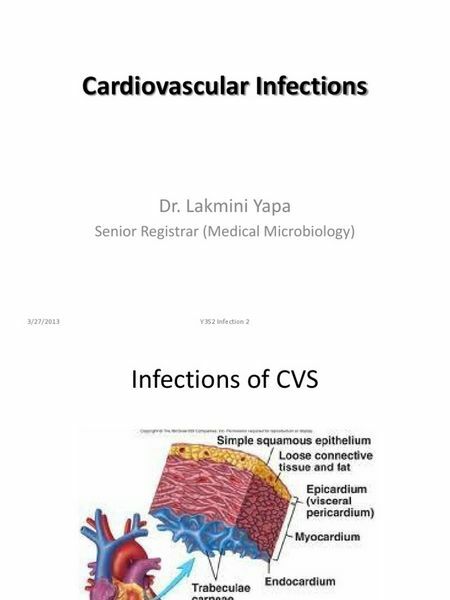 A definitive diagnosis of infective endocarditis in the absence of valve tissue histopathology or culture is often difficult, and many investigations of this disease have been plagued by differences in the clinical definition of infective endocarditis. Clinical criteria have been established that allow cases to be classified as definite and possible. Using the modified Duke criteria, a finding of 2 major criteria, or 1 major criterion and 3 minor criteria, or 5 minor criteria classifies a case as definite infective endocarditis. A finding of 1 major and 1 minor criterion, or 3 minor criteria, classifies a case as possible infective endocarditis. In the modern antibiotic era, complications associated with infective endocarditis remain common, with approximately 60% of patients experiencing one complication; 25%, two; and 8%, three or more complications. Blood cultures spaced at least 15 minutes apart, three over 24 hours for subacute bacterial endocarditis. Large volumes of blood (at least 10 mL) need to be added to blood culture flasks. Blood cultures are usually negative for at least 7 days after an antibiotic is given. Documentation of endocardial involvement [transesophageal echocardiography (TEE) is more sensitive than transthoracic echocardiography]; TEE always preferred in prosthetic valve endocarditis. Duke criteria are helpful in making the clinical diagnosis of infective endocarditis in the absence of pathologic tissue. Complications involving the heart are most frequent, occuring in one third to one half of patients. Congestive heart failure is the most common complication that leads to surgical intervention. Destruction of the valve leaflets results in regurgitation. Less commonly, vegetations become large enough to obstruct the outflow tract and cause stenosis. Perivalvular extension of infection also requires surgical intervention. This complication is more common with aortic valve disease, and spread from the aortic valvular ring to the adjacent conduction system can lead to heart block. This complication should be suspected in the infective endocarditis patient with peripheral leukocytosis, persistent fever while on appropriate antibiotics, or an abnormal conduction time on electrocardiogram. Transesophageal echo detects most cases, and this test should be performed in all patients with aortic valve endocarditis. Less common complications include pericarditis and myocardial infarction. Pieces of the vegetation — consisting of a friable collection of platelets, fibrin, and bacteria — frequently break off and become lodged in arteries and arterioles throughout the body. Small emboli are likely released in all cases of endocarditis, but they are symptomatic in only one sixth to one third of patients. Patients with large vegetations (exceeding 10 mm) and vegetations on the anterior leaflet of the mitral valve are at higher risk for systemic emboli. Because the right brachiocephalic trunk (innominate artery) is the first vessel to branch from the ascending aortic arch, emboli have a higher likelihood of passing through that vessel and into the right internal carotid artery. The second branch coming off the aortic arch is the left common carotid artery, and the likelihood of emboli entering this vessel is also higher. These anatomic considerations probably account for the observation that two thirds of left-sided systemic emboli from the heart lodge in the central nervous system. In addition to sudden neurologic deficits, patients can experience ischemic limbs and splenic and renal infarction. Patients with right-sided endocarditis frequently develop recurrent pulmonary emboli. Symptomatic emboli more commonly occur in patients with S. aureus and fungal endocarditis and in patients infected with slow-growing organisms such as those in the HACEK group. Antibiotic therapy is associated with fibrotic changes in the vegetation, and after 2 weeks of therapy, the risk of emboli is markedly reduced. Infectious emboli can become lodged at arterial bifurcations, where they occlude the vasa vasorum or the entire vessel lumen, damaging the muscular layer of the vessel. The systemic arterial pressure causes ballooning of the weakened vessel wall and formation of an aneurysm. Aneurysms are most commonly encountered in the middle cerebral artery, abdominal aorta, and mesenteric arteries. On occasion, these aneurysms can burst, resulting in intracerebral or intra-abdominal hemorrhage. Because of the increased risk of hemorrhage, anticoagulation should be avoided in patients with infective endocarditis. Mycotic aneurysms are most commonly encountered in S. aureus endocarditis. Complications arising in the central nervous system are second only to cardiac complications in frequency, being seen in 25% to 35% of patients. In addition to embolic stokes and intracerebral hemorrhage, patients can develop encephalopathy meningitis, meningoencephalitis, and brain abscess. In the past, development of a neurologic deficit was considered a contraindication to cardiac surgery. More recent experience indicates that surgery within 1 week of the neurologic event is not accompanied by worsening neurologic deficits. Significant renal failure (serum creatinine above 2 mg/dL) can develop in up to one third of patients, with the likelihood of this complication being higher in elderly patients and in those with thrombocytopenia. Renal dysfunction can be caused by immune-complex glomerulonephritis, renal emboli, and drug-induced interstitial nephritis. Glomerulonephritis results from deposition of immune complex in the basement membranes of the glomeruli, resulting in the microscopic changes of membranoproliferative disease. Urinalysis reveals hematuria and mild proteinuria. Red cell casts are observed in glomerulonephritis, but not in interstitial nephritis. Glomerulonephritis usually improves rapidly with antibiotic therapy. Whenever possible, the antibiotic therapy of subacute infective endocarditis should be based on the antibiotic sensitivities of the offending organism or organisms. Because bacteria are protected from neutrophil ingestion by the dense coating of fibrin found in the vegetation, bactericidal antibiotics are required to cure this infection. To design the most effective regimen, minimal bactericidal levels should be determined for multiple antibiotics, and combinations of these antibiotics tested for synergy. The goal is to achieve serum cidal levels of 1:8 to 1:32, these levels of cidal activity being associated with cure. A second important principle of antibiotic therapy is the requirement for prolonged treatment. The concentrations of bacteria in the vegetation are high, and a significant percentage of the bacteria slow their metabolism and stop actively dividing for significant periods. These conditions prevent immediate sterilization by cidal antibiotics that require active bacterial growth for their action (penicillins, cephalosporins, and gly-copeptide antibiotics). To prevent relapse, most curative regimens are continued for 4 to 6 weeks. One exception is uncomplicated subacute bacterial endocarditis caused by S. viridans species. The combination of penicillin G and gentamicin is synergistic and is associated with more rapid killing of bacteria in vegetations. Two thirds of systemic emboli go to the cerebral cortex. Combination therapy for 2 weeks results in cure rates similar to those with penicillin alone for 4 weeks. A 2-week course of ceftriaxone and gentamicin achieves comparable results. The gentamicin dose should be adjusted to maintain peak serum levels of 3 µg/mL, the concentration required to achieve synergy. In acute bacterial endocarditis, intravenous empiric antibiotic therapy should be initiated immediately after three blood samples for culture have been drawn. The combination of vancomycin, ampicillin, and gentamicin is recommended to cover the most likely pathogens (S. aureus, including methicillin-resistant Staphylococcus aureus; S. pneumoniae, and ente-rococci), pending culture results. Empiric therapy for culture-negative subacute bacterial endocarditis should include ampicillin and gentamicin to cover for entero-cocci, the HACEK group, and nutritionally deficient streptococci. Whenever possible, a synergistic regimen consisting of a β-lactam antibiotic and an aminoglycoside is preferred. One exception to this rule is S. aureus. Combination therapy with nafcillin or oxacillin and gentamicin may shorten the duration of positive blood cultures, but has not been shown to improve mortality or overall cure rates, and therefore dual antibiotic therapy is not recommended. With the exception of ceftazidime, minimum inhibitory concentrations for cephalosporins correlate well with therapeutic response, and these agents are often therapeutically equivalent to the semisynthetic penicillins. The β-lactam antibiotics are preferred over vancomycin because vancomycin is less rapidly cidal, and failure rates of up to 40% have been reported when S. aureus endocarditis is treated with vancomycin. Daptomycin has been shown to be non-inferior to vancomycin in methicillin-resistant Staphylococcus aureus bacteremia and endocarditis. In the penicillin-allergic patient with methicillin- sensitive S. aureus endocarditis, β-lactam desensitization should be strongly considered. In patients with enterococcal endocarditis, cephalosporins are ineffective and should not be used. Maximal doses of intravenous penicillin or ampicillin combined with gentamicin are preferred, and this combination is recommended for the full course of therapy. However, one series noted comparable cure rates when gentamicin was administered for the first 2 weeks of therapy. Vancomycin combined with gentamicin is a suitable alternative in the penicillin-allergic patient. With the exception of uncomplicated infection with S. viridans species, antibiotic treatment should be continued for 4 to 6 weeks. Antibiotic therapy for prosthetic valve endocarditis presents a particularly difficult challenge. The deposition of biofilm on the prosthetic material makes cure with antibiotics alone difficult, and the valve often has to be replaced. Some patients with late-onset prosthetic valve endocarditis caused by very antibiotic-sensitive organisms can be cured by antibiotic treatment alone. In patients with coagulase-negative staphylococci, a combination of intravenous vancomycin (1 g twice daily), and rifampin (300 mg three times daily) for more than 6 weeks, plus gentamicin (1 mg/kg three times daily) for 2 weeks, is the preferred treatment for methicillin-resistant strains. For methicillin-sensitive strains, nafcillin or oxacillin (2 g every four hours) should be substituted for vancomycin. Intravenous drug abusers with uncomplicated tricus-pid valve S. aureus endocarditis can be treated with 2 weeks of intravenous nafcillin or oxacillin (2 g every four hours) combined with tobramycin (1 mg/kg three times daily). This abbreviated regimen is not recommended in HIV-antibody-positive patients. An oral regimen of ciprofloxacin (750 mg twice daily) and rifampin (300 mg twice daily) for 4 weeks has also proved effective, provided that the S. aureus strain is sensitive to ciprofloxacin. Cidal antibiotics must be used, and therapy must be prolonged. Therapy for 4 to б weeks (except for uncomplicated Streptococcus viridans infection, in which penicillin or ceftriaxone combined with low-dose gentamicin for 2 weeks is effective). Therapy must be guided by minimum inhibitory concentration and synergy testing. Synergistic therapy not shown to be of benefit in Staphylococcus aureus infection. Whenever possible, p-lactam antibiotics are preferred over vancomycin. Antibiotics alone rarely sterilize prosthetic valves. Some success with coagulase-negative staphylo-cocci using vancomycin, gentamicin,and rifampin. nafcillin or oxacillin plus gentamicin for 2 wks is effective, except in HIV-infected patients. oral ciprofloxacin plus rifampin for 4 weeks also may be effective. Medical therapy alone is often not curative, particularly in prosthetic valve endocarditis. In a significant percentage of patients, surgical removal of the infected valve or debridement of vegetations greatly increases the likelihood of survival. As a consequence, in recent years, the threshold for surgery has been lowered. Moderate-to-severe CHE Congestive hear failure is the most frequent indication for surgery. A delay in surgery often results in a fatal outcome because of irreversible left ventricular dysfunction. In patients with congestive heart failure, death can be very sudden. More than one systemic embolus. The ability to predict the likelihood of recurrent emboli by echocar-diography is questionable. In some studies, large vegetations (exceeding 10 mm in diameter) and vegetations on the anterior leaflet of the mitral valve were found to have a higher probability of embolizing. Uncontrolled infection. S. aureus is one of the most common pathogens to cause persistently positive blood cultures. Extravascular foci of infection should always be excluded before surgical intervention is considered. Resistant organisms or fungal infection. The mortality in fungal endocarditis approaches 90%, and with the exception of a rare case of Candida albicans, cures have not been achieved by medical therapy alone. Perivalvular/myocardial abscess. With the exception of very small abscesses, these lesions usually enlarge on medical therapy and require surgical debridement and repair. The threshold for surgery should be low; it increases the likelihood of cure. The cardiologist and cardiac surgeon should be consulted early. moderate-to-severe congestive heart failure. Early surgery lowers intraoperative and postoperative mortality. more than 1 systemic embolus. resistant bacteria or a fungal pathogen. perivalvular leak or myocardial abscess. Neurologic deficits are not an absolute contraindication to surgery. Neither positive blood cultures at the time of surgery nor positive valve cultures have been associated with increased risk of relapse. As discussed earlier in "Neurologic complications", a focal neurologic deficit is not an absolute contraindication to surgery. Whenever possible, surgery should be delayed until blood cultures are negative to reduce the risk of septic intraoperative complications. However, even in the setting of ongoing positive blood cultures, infection of the new valve is uncommon, particularly if the surgeon thoroughly debrides the infected site. Relapse following surgery is rare (0.8%) and has not been shown to be related to positive blood cultures at the time of surgery or to positive valve cultures. Identification by Polymerase chain reaction of the bacterial cause of valve tissue infection is a promising experimental method that should make diagnosis and treatment of culture-negative bacterial endocarditis more accurate. Cure rates depend on the organism involved and the valve infected. S. aureus remains a particularly virulent pathogen and continues to be associated with a 50% mortality in patients over the age of 50 years. Patients with an infected aortic valve accompanied by regurgita-tion also have a 50% mortality. Fungal infections and infections with gram-negative aerobic bacilli are associated with poor outcomes. Development of congestive heart failure or onset of neurologic deficits is associated with a worse prognosis. Patients with early prosthetic valve endocarditis often do poorly despite valve replacement, with cure rates ranging from 30% to 50%. Late prosthetic valve endocarditis has a better outcome. In patients with late prosthetic valve infection with S. viridans species, cure rates of 90% have been achieved when antibiotic therapy is accompanied by surgery and 80% with antibiotic treatment alone. Patients with S. epidermidis late prosthetic valve endocarditis have been cured 60% of the time medically, and they have a 70% cure rate when medical treatment is combined with valve replacement. The efficacy of prophylaxis for native-valve endocarditis has never been proved. Individuals probably experience multiple episodes of transient bacteremia each day, and this cumulative exposure is hundreds of times greater than a single procedure. As a consequence of these concerns, the American Heart Association now recommends antibiotic prophylaxis only for high-risk patients. High-risk patients are defined as patients with prosthetic valves (including bioprosthetic and homograft valves), a past history of endocarditis, complex cyanotic congenital heart disease, or surgically constructed systemic pulmonary shunts. The timing of antibiotic prophylaxis is important. The antibiotic should be administered before the procedure and timed so that peak serum levels are achieved at the time of the procedure. The efficacy of prophylaxis has not been proved; however, it is considered the standard of care. Give to high-risk (prosthetic valve, previous endocarditis, cyanotic heart disease, surgical shunt) and moderate-risk (rheumatic and other acquired valvular dysfunction, hypertrophic cardiomyopathy, mitral valve prolapse with regur-gitation) patients. Give in time to achieve peak antibiotic levels at the time of the invasive procedure. Viral pericarditis usually has a self-limiting benign course. However, patients with purulent pericarditis have a high mortality and require emergent care. Inflammation of the pericardium has multiple infectious and noninfectious causes. Of cases in which a cause can be determined, a virus is most common. The same viruses that invade the myocardium also attack the pericardium. Bacteria can also cause pericarditis, resulting in purulent disease. In the antibiotic era, pericarditis has become rare. S. aureus, S. pneumoniae, and other streptococci are the leading causative organisms, although virtually any bacterium can cause purulent pericarditis. The pericardium can become infected as a result of hematogenous spread (the most common route today) or by spread from a pulmonary, myocardial, or subdiaphragmatic focus. Purulent pericarditis can also be a delayed complication of a penetrating injury or cardiac surgery. Postoperative infections are most commonly caused by S. aureus, gram-negative aerobic rods, and Candida species. Tuberculous pericarditis results from hematogenous spread during primary disease, from lymphatics draining the respiratory tract, or from direct spread originating in the lung or pleura. Initially, infection causes fibrin deposition and development of granulomas containing viable mycobacteria; gradual accumulation of pericardial fluid — initially containing polymorphonuclear leukocytes, and then eventually lymphocytes, monocytes, and plasma cells — follows. Finally, the effusion is absorbed, and the pericardium thickens, becomes fibrotic, and calcifies. Over time, the pericardial space shrinks, causing constrictive pericarditis. Clinical manifestations of pericarditis vary depending on the cause. Viral and idiopathic pericarditis usually present with substernal chest pain, which is usually sharp and made worse by inspiration. Pain is also worsened by lying supine, the patient preferring to sit up and lean forward. In acute bacterial pericarditis, the patient suddenly develops fever and dyspnea, and only one third of patients complain of chest pain. Because of the lack of specific symptoms, a diagnosis of purulent pericarditis is often not considered, and the diagnosis is made only at autopsy. Tuberculous pericarditis is more insidious in clinical onset. Vague, dull chest pain, weight loss, night sweats, cough, and dyspnea are most commonly reported. The classic physical findings of pericarditis include a scratchy three-component friction rub (as result of the moving heart rubbing against the abnormal pericardium during atrial systole), early ventricular filling, and ventricular systole. When the pericardial effusion increases in volume, the friction rub usually disappears. The hemodynamic consequences of the pericardial effusion can be assessed by checking for pulsus paradoxicus; a value exceeding 10 mm Hg indicates significant tamponade. A second hemodynamic consequence of pericardial tamponade is a rise in right ventricular filling pressure. High right-sided pressure causes an increase in jugular venous distension and abnormal jugular venous pulsations with a loss of Y descent. The patient often has a rapid respiratory rate and complains of dyspnea. However, because of the equalization of right- and left-sided cardiac pressures, pulmonary edema does not develop, and the lung fields are clear on auscultation. Main symptom is substernal chest pain, which is relieved by sitting forward. Pain is less common in purulent pericarditis and has a gradual onset in tuberculous disease. three-component friction rub early; rub later disappears with increased pericardial fluid. pulsus paradoxicus (exceeding 10 mm Hg is abnormal). jugular venous distension with depressed Y descent. Allows for assessment of pericardial thickness, pericardial fluid,and tamponade. Can be used to guide emergency pericardio-centesis. Electrocardiogram shows diffuse ST and T changes, depressed PR interval, decreased QRS voltage, electrical alternans. Pericardiocentesis only for those with tamponade or suspected of having purulent pericarditis. Pericardial biopsy improves the diagnostic yield. Viral or idiopathic pericarditis is self-limiting. Use nonsteroidal agents only if no myocarditis. Purulent pericarditis requires emergency surgical drainage and systemic antibiotics. Mortality is 30%. prednisone to prevent constriction (20% to 50% incidence during treatment). Electrocardiogram is abnormal in 90% of patients and may show diffuse ST segment elevation, depression of the PR segment, and (when the effusion is large) decreased QRS voltage and electrical alternans. The electrocardiography findings are usually not specific, and when pericarditis is being considered, echocardio-graphy is the critical test that needs to be ordered. The echocardiogram readily detects pericardial thickening and pericardial fluid accumulation. In life-threatening tamponade, echocardiography can be used to guide pericardiocentesis. In the absence of hemodynamic compromise, pericardiocentesis is not recommended because of the low diagnostic yield and moderate risk of the procedure. However, in patients with significant pericardial tamponade, pericardial fluid yields a diagnosis in one quarter of cases, and pericardial biopsy in half of patients. Pericardial fluid and tissue biopsy can be performed surgically. In an emergency, echocardiography-guided catheter pericardiocentesis can be performed. In patients with a thickened pericardium, a percutaneous pericardial biopsy can safely be performed. Viral and idiopathic pericarditis are usually benign self-limiting disorders that can be treated with bed rest. Nonsteroidal anti-inflammatory agents are helpful for reducing chest pain, but they should probably be avoided in patients with accompanying myocarditis. Colchicine (1 mg daily) may also be helpful for reducing symptoms in cases of idiopathic disease. In patients with purulent pericarditis, surgical drainage of the pericardium should be performed emergently accompanied by systemic antibiotic therapy. This disease continues to generate a 30% mortality. Tuberculous pericarditis should receive four-drug antituberculous therapy. However, during treatment, 20% ro 50% of patients progress to constrictive pericarditis. This complication can be prevented by simultaneous administration of oral prednisone (60 mg for 4 weeks, 30 mg for 4 weeks, 15 mg for 2 weeks, and 5 mg for 1 week). Patients who have developed calcific tuberculous pericarditis at the time of diagnosis require pericardiectomy for relief of symptoms.